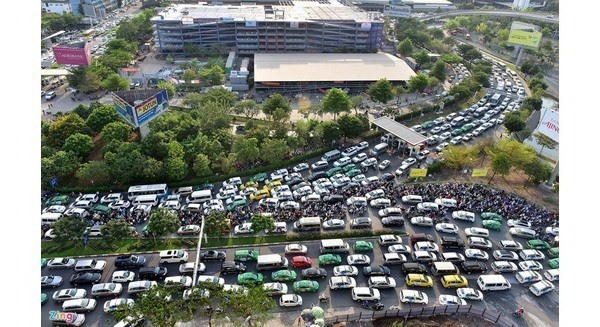 HCM CITY — The HCM City People’s Committee has urged completion of key road projects near Tân Sơn Nhất airport in HCM City to alleviate traffic congestion. The projects have faced delays in site clearance and compensation, the committee said last week. The expansion project for Hoàng Hoa Thám Street, with investment capital of VNĐ255 billion (US$10.8 million), is still waiting for land to start construction, according to the city’s Department of Transport. The People’s Committee of Tân Bình District, where the airport is located, said the value of land owned by the Ministry of Defense near the airport must be assessed first before the land is reclaimed. If the district committee hands over the land in the third quarter, construction is expected to be completed in the second quarter of 2020. Similarly, the project to upgrade the 134-metre-long and 14-19 metre-wide Cộng Hòa Street, with total capital of VNĐ142 billion ($6.12 million), is also waiting for site clearance. If Tân Bình District hands over the land in the third quarter, the project will begin in the second quarter of 2020, according to the transport department. Other ongoing projects, including Trường Chinh Street and Tân Kỳ Tân Quý Street expansion, are still waiting for capital to implement other phases of the projects. Trần Vĩnh Tuyến, vice chairman of the city People’s Committee, said that expansion of roads around the airport and the airport’s connecting roads need to be done concurrently. Districts and agencies have been asked to speed up implementation and inform the city of any problems. As for issues within the jurisdiction of the Ministry of Defense, the city government will report to the central government for further guidelines. Since the projects use the city’s state budget funds, implementation must be transparent so that qualified contractors can be hired and new technologies used to ensure work quality. Environmental hygiene must also be assured, the city said. Under a plan approved by the Ministry of Transport to expand the airport to serve 50 million passengers per year by 2020, roads to the airport are expected to be built as soon as possible. The ministry has asked the Civil Aviation Authority of Việt Nam to work with agencies and localities to implement the plan. Tân Sơn Nhất International Airport, the country’s busiest airport, has become seriously overloaded both on the ground and in the air, forcing many flights to wait in the air to land.